The American Shorthair cat (ASH) is a robust 'working cat' that has been around for five centuries, albeit under a different name, the Domestic Shorthair. Grand Champion Caellcats Red Texan At Dawn of Catalpa, owned by Leslie Herman. © Larry Johnson. Over time, the breed has evolved and this magnificent cat no longer earns its keep by ensuring that homes and farms are rodent free. Well, they are still ardent hunters, but let's just say that nowadays, hunting is done on their terms. This domestic cat is a medium-to-large and solidly built cat and whilst medium-boned, it is a very muscular and powerful cat with well developed shoulders, chest and hindquarters. The American Shorthair cat is described as a robust and sturdy cat that is slightly longer than it is tall. The legs complement the body and are medium in length and also heavily muscled. The tail is quite heavy and medium length. The cat has a large head (but it suits the body) and full-cheeks which gives its face a sweet, open expression. In our opinion, they are 'masculine-looking' cats - they have a long strong jaw (which helps for catching prey), square muzzle and a square and well developed chin. Male cats often have jowls. Eyes are large, wide-set, bright and alert and the eye-color must be appropriate to the coat color. Whilst a brilliant gold eye color is seen in most coats, blue or odd-eyes are seen in white cats; green and hazel eyes are seen in tabbies and green to blue-green eyes are found in tipped coats. The American Shorthair cat was originally a working cat, used for catching rodents. As a result of this the cat developed a thick, dense and hard textured coat - a coat to protect them from the elements and from their prey and predators. The coat is described as short, thick and glossy and lies close to the body. For extra measure, they have a dense undercoat that protects the cat from cold, moisture and superficial skin injuries. Solid colors (i.e. red, blue, black, white); Smoke, Bi-colors, Parti-colors and a range of Tabbies (i.e. patched, classic, mackerel and tortie). 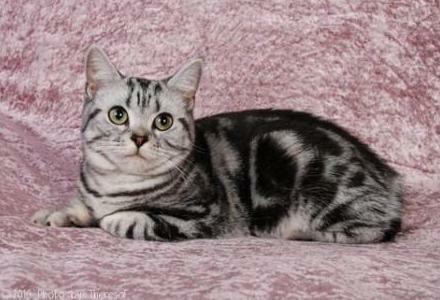 Note: color point, lilac and chocolate are not recognized colors in the American Shorthair cat. American Shorthair cats are not suited to a totally indoor lifestyle and apartment living is not ideal for them. They are active cats - excellent hunters who need access to a large, safe, enclosed garden. A kitty enclosure would be ideal - an adventure zone filled with kitty toys, gyms, non-toxic plants and cat scratchers. An enclosure of this type will allow for safe access to the outdoors. This cat makes a wonderful companion for young and old. It is an even-tempered cat that has been known to tolerate 'dress-up' and dolls and will seek the company of a child at nap time and playtime. It prefers to be on the ground and will struggle to be put down if carried for any length of time. Shorthairs do get on well with dogs and other cats. The American Shorthair is a placid, calm, easy-going cat - loving and affectionate by nature with a sweet disposition. This cat adores its owners, but is not very demanding of their attention. Basically, they subscribe to the theory of 'let's be seen but not heard'. Some owners say their cats are not very demonstrative, but prefer to be a quiet companion. In other words, they like to be close to you, not on top of you. It can tolerate solitude, but prefers the company of its owners. This does not mean it is a lazy couch potatoe, to the contrary, it is a playful, athletic, outgoing and most of all, very intelligent cat. 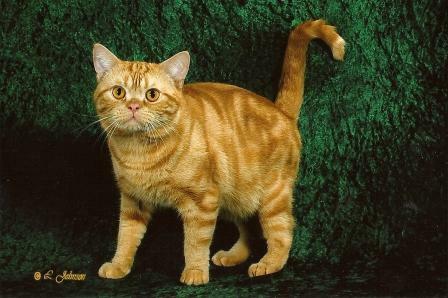 This cat is independent and very alert which makes it an excellent hunter - it demonstrates power, endurance and agility. Even though it has a short coat, it does need to be brushed once a week. During shedding time (change of season), more frequent brushing may be required. The American Shorthair cat is a medium-low maintenance cat breed. For complete cat care visit our comprehensive grooming pages. HCM or Feline Hypertrophic Cardiomyopathy is a common heart disease found in some lines of the breed. Feline hip dysplasia can also be found in certain cats, so do get a health guarantee from the cat breeder. Take your cat for an annual health check-up. At this visit, the veterinarian will administer annual booster vaccinations, de-worm your cat and check its teeth. Cat health insurance is always recommended. This cat is prone to obesity so it's important that it is fed a well balanced diet. Do not overfeed your cat, portions need to be controlled. Chat to your vet about diet cat food if your cat shows signs of gaining weight. Visit our cat food chapters for info related to diet. Avoid or at the very least restrict the intake of treats and milk and dairy products. Always provide your cat with fresh, clean drinking water. The average weight is 3.5 - 7.0 kg (8.0 - 15.0 lbs). Male cats are heavier than female cats. Be prepared for long-term commitment! The American Shorthair has an average life span of between 12 - 20 years.